"As we believe that life is a process, we also think that respect and quality needs to be earned, that it requires time and dedication. Each of our pieces has it’s own story, written by talented, friendly and skilled woman’s hands. It is gaining the confidence of our partners, slowly, carefully, that we are now able and proud to propose such qualitative products. So yes, Soft is an Euphemism, try to think of a silky, cashmery, woolish cloud and you’ll get what we mean. Materials chosen are as raw as possible, we think it’s absolutely necessary to keep a maximum of authenticity. 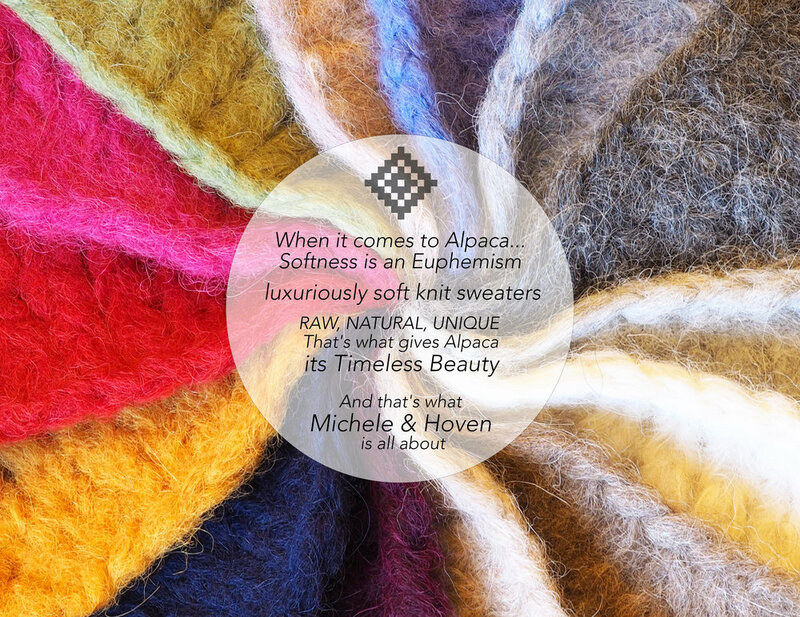 We really believe that Less is more regarding Alpaca. When you treat yourself with one of our garment, you buy a lifetime companion, made just for you with all the love and "savoir faire" it involves. That’s why it is a 4 to 6 weeks process. Michele & Hoven is a one of a kind brand, we only work on demand, to be sure to offer the best services and quality for a very unique experience. Which piece did you fell in love with ? Let us know !